Al-Shuaiba Lagoon area locates along the eastern Red Sea coast, south of Jeddah city, Saudi Arabia. Its soil profile consists mainly of coarse-grained saline sabkha soil. Based on the vertical variations of grain size, the studied Al-Shuaiba Lagoon soil profile was subdivide into three zones A: saline sandy gravels, B: calcareous sandy silts and C: well-graded sands. According to the SPT-N60 values, these soil zones were classified into stiff, medium stiff and very stiff soil-type. The soil zone B has CC values vary from 0.234 to 0.279 thus it classifies into loose and very high compressible soil. Consequently, based on the exchangeable sodium percentages vs. cation exchange capacity (CEC) classification chart, the soil zone B was classified into medium dispersive potential soil-type. The studied soil samples contain a relatively higher TDS values and high concentration of calcium carbonates, sulfates, and chlorides. Thus, these salts can play an essential harmful effectiveness on the durability of concrete when reacted with cement alkalis. The original version of this article was revised: In the original publication, the article title was published incorrectly. 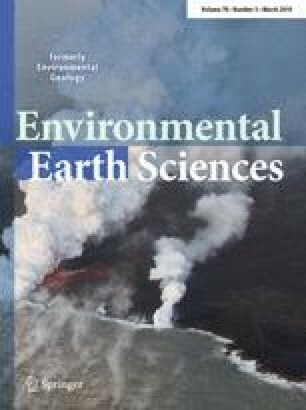 The correct article title should be “Geotechnical aspects and associated problems of Al-Shuaiba Lagoon soil, Red Sea coast, Saudi Arabia”. A correction to this article is available online at https://doi.org/10.1007/s12665-019-8223-2. This project was funded by the Deanship of Scientific Research (DSR), King Abdulaziz University, Jeddah, under grant no. 34-145-438. The authors, therefore, acknowledge and thank the Deanship of Scientific Research (DSR) for the technical and financial support they kindly provided. Additionally, the authors are deeply grateful to Prof. Dr. James W. LaMoreaux (Editor-in-Chief) and the three anonymous reviewers for insightful comments and criticism that improved the original manuscript.